The 1984 United States presidential election in Illinois took place on November 6, 1984. All 50 states and the District of Columbia, were part of the 1984 United States presidential election. Illinois voters chose 24 electors to the Electoral College, which selected the president and vice president of the United States. 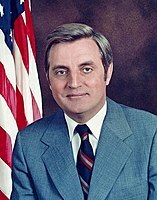 Illinois was won by incumbent United States President Ronald Reagan of California, who was running against former Vice President Walter Mondale of Minnesota. Reagan ran for a second time with former C.I.A. Director George H. W. Bush of Texas, and Mondale ran with Representative Geraldine Ferraro of New York, the first major female candidate for the vice presidency. The presidential election of 1984 was a very partisan election for Illinois, with over 99% of the electorate voting only either Democratic or Republican, though several other parties did appear on the presidential ballot in the State. Nearly every county in Illinois voted in majority for Reagan, a particularly strong turnout in this rapidly liberalizing state. One notable exception to this trend was Chicago's highly populated Cook County, which voted in majority for Mondale, albeit with a 2.6% margin, or 51% to 48.4%. 1984 marks the last time any presidential candidate won Cook County with a single digit margin, and the last election that a Republican won over a million votes in that county. Illinois weighed in for this election as 2% more Democratic than the national average. As of the 2016 presidential election[update], this is the last election in which Jackson County voted for the Republican candidate. On the campaign trail, President Reagan and First Lady Nancy Reagan wave from limousine while touring Dixon, Illinois. February, 1984. Reagan won the election in Illinois with a decisive 13 point landslide, carrying all but five counties. No Republican candidate has received as strong of support in the American Great Lakes States, at large, post Reagan. While Illinois typically voted conservative at the time, the election results in Illinois are also reflective of a nationwide reconsolidation of base for the Republican Party which took place through the 1980s; called by Reagan the "second American Revolution." This was most evident during the 1984 presidential election. Reagan also enjoyed high levels of bipartisan support during the 1984 presidential election, both in Illinois, and across the nation at large. Many registered Democrats who voted for Reagan (Reagan Democrats) stated that they had chosen to do so because they associated him with the economic recovery, because of his strong stance on national security issues with Russia, and because they considered the Democrats as "supporting American poor and minorities at the expense of the middle class." These public opinion factors contributed to Reagan's 1984 landslide victory, in Illinois and elsewhere. Notably, this is the closest to date that a Republican has come to carrying Cook County, home to Chicago, since Richard Nixon won it in 1972. Mondale took 51 percent of Cook County's vote to Reagan's 48.4 percent.